The earthquake started in earnest in November 2017. At its epicentre was a report, published in November 2017 by two researchers at the International Institute for Sustainable Development (“IISD“). In the report, titled “Is ‘Moonlighting’ a Problem? The role of ICJ Judges in ISDS”, researchers Nathalie Bernasconi-Osterwalder and Martin Dietrich Brauch analysed the contents of several public databases of ISDS cases, and found that at least seven judges at the International Court of Justice (“ICJ” or the “Court“) at the time of publishing (and 13 former judges) had worked (or were working at the time of the report) as arbitrators in treaty-based investor state dispute settlement cases during their terms at the ICJ. Crunching the numbers further, the two IISD researchers looked at the amount of treaty-based cases in which ICJ judges had served as arbitrators. They compared the number against the 817 treaty-based ISDS cases known as of July 2017. The results were surprising: ICJ judges had sat as arbitrators in roughly 10% of all known investment treaty cases during their tenure. This raises three types of concerns. First, it seems to contravene the prohibition for ICJ judges to “engage in any other occupation of a professional nature” contained in the Statute of the International Court of Justice (the “ICJ Statute“). Second, arbitrators are usually paid according to the time (calculated in days or hours) spent working on a case. This means that any ICJ judge who is also appointed as an arbitrator would have an economic incentive to spend more time on the investment treaty case, to the potential detriment of the judge’s Court-related work. Third, cumulating the roles of ICJ judge and arbitrator (or, as the report called it, “moonlighting”) could potentially impact, or be perceived to impact, the judge’s independence and impartiality. The IISD report fuelled debate within the international legal community, and even piqued the mainstream media’s interest. It was the catalyst for renewed discussions and a debate on the independence of ICJ judges which culminated into the announcement of 25 October 2018 discussed below. Of course, there have been discussions around activities by ICJ judges outside of their judicial appointment for as long as the Court existed. The Court, established in 1945 by the UN Charter, is regulated by the ICJ Statute, which provides in its Article 16 that “no member of the Court may exercise any political or administrative function, or engage in any other occupation of a professional nature”. The deceptively simple text belies a more complicated reality, in which ICJ judges must be mindful not to cross the line between common practice and prohibited extrajudicial activities. As early as the 1990s, questions had been raised on what exactly the prohibition in Article 16 entailed, culminating into a ping pong-like exchange between the UN General Assembly and the Court in 1995 and 1996. On 2 November 1995, the UN Secretary-General published report A/C.5/50/18 on the conditions of service and compensation for Members of the International Court of Justice. The report summarises the Court’s position with respect to Article 16 of the Statute, and clarifies that it contains a prohibition on ICJ judges “holding a position in a commercial concern, engaging in the practice of law, maintaining membership in a law firm or rendering legal or expert opinions; or holding a permanent teaching or administrative position in a university or faculty of law”. According to the Court, however, Article 16 does not prevent “a limited participation of Judges in other judicial or quasi-judicial activities of an occasional nature, as well as scholarly pursuits in the sphere of international law as members of learned societies or as occasional lecturers”. Interestingly, the Court also told the General Assembly that it considered “occasional appointments as arbitrators” to fall outside the scope of the Article 16 prohibition on the basis of “a long-standing tradition of the Permanent Court of International Justice founded in 1922, as well as the recorded intention of the United Nations Conference on International Organization that adopted the text of Article 16 of the Statute”. In a report dated 12 December 1995, the Advisory Committee on Administrative and Budgetary Questions (“ACABQ“), a subsidiary of the General Assembly responsible for expert examination of the UN programme budget, voiced concerns about “the extent of outside remunerated activities engaged in by [ICJ] Judges; the time spent on those activities; the payment received for those activities; the extent of the use of the Court facilities, including staff for those activities; the issue of disclosure of remuneration received from those activities; and the need for guidelines on these issues”. 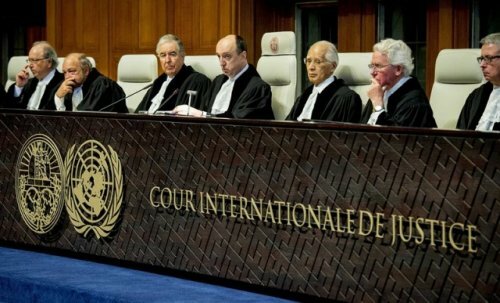 Unsatisfied by the explanations provided by the ICJ, the ACABQ politely sent the Court back to the drawing board by suggesting that “the General Assembly may wish to consider inviting the Court to look again at this issue in the light of the observations and concerns of the Advisory Committee”. The Court responded to those concerns in its 1995-1996 Annual Report to the General Assembly, in which it reiterated that it was common practice for ICJ judges to engage in occasional activities outside the Court, e.g. “acting as arbitrators in inter-State and private international arbitrations, serving in administrative tribunals or quasi-judicial organs of specialized agencies, lecturing, writing”. This practice, the Court’s 1995-1996 Annual Report noted, went back to the origins of the Permanent Court of International Justice, and was nothing to be concerned about: “Not only is it in conformity with the Statute of the Court; the repeated endorsement by the international organs and by the States that have appointed Members of the Court as arbitrators shows their awareness of the contribution that the Members of the Court may, by this function, make to the development of international law, and of the benefits deriving therefrom for all institutions concerned”. This seemed to temporarily close the debate. The “moonlighting” debate echoes another controversial practice: that of “double hatting”, in which individuals wear two “hats” by simultaneously acting as arbitrators and legal counsel in international investment arbitration. The concept, which has gained notoriety in the last few years, is similar to moonlighting. It results in a what Langford, Behn and Lie have called the “revolving door” of international investment arbitration in which individuals act sequentially and even simultaneously as arbitrator, legal counsel, expert witness, or tribunal secretary (for further detail, see Langford, Behn and Lie’s excellent empirical analysis in the Journal of International Economic Law last year). There have been concerns over the ethical and normative implications of the practice of double hatting. Double hatting has a number of high-profile critics, such as scholar and arbitrator Philippe Sands and former ICJ judge Thomas Buergenthal. Recent international agreements have started to reflect concerns that were once the sole province of academics. For example, the Canada-EU Comprehensive Economic and Trade Agreement (“CETA“) imposes a ban on double hatting by explicitly stipulating that members of the Tribunal “shall be independent” and that “upon appointment, they shall refrain from acting as counsel or as party-appointed expert or witness in any pending or new investment dispute under this or any other international agreement” (Article 8.30(1) CETA). This increased scrutiny of the independence of international judges and arbitration is just another symptom of the wider malaise in public international law, and in particular in the field of international investment arbitration which is suffering from a particularly bad case of legitimacy crisis. Professor Philippe Sands pointed to a legitimacy crisis in international law when he gave the 2015 ESIL Annual Conference Final Lecture on “The End(s) of Judicialization”. In his address, Prof. Sands pointed out that the Court, which is the principal judicial organ of the UN, “appears to have the lowest standard in the world for testing judicial independence, yet it should have the highest”. Professor Sands noted that “it [was] not about actual bias, but about perception and improving standards”. On 25 October 2018, the President of the ICJ, His Excellency Mr. Abdulqai A. Yusuf, addressed the UN General Assembly for the first time since taking up the prestigious leading role in February this year. The Court is cognizant of the fact that, while the judicial settlement of disputes offered by the Court is enshrined in the Charter, States may, for several reasons, be interested in settling their disputes by arbitration. In such instances, Members of the Court have sometimes been called upon by States to sit on the arbitral tribunals in question dealing in some cases with inter-State disputes while in others with investor-State disputes ¾ a testament, of course, to the high esteem in which the Court’s Judges are held by the international community. Over the years, the Court has taken the view that, in certain circumstances, its Members may participate in arbitration proceedings. However, in light of its ever-increasing workload, the Court decided a few months ago to review this practice and to set out clearly defined rules regulating such activities. As a result, Members of the Court have come to the decision last month that they will not normally accept to participate in international arbitration. In particular, they will not participate in investor-State arbitration or in commercial arbitration. ICJ judges will remain able to participate in inter-State arbitrations only in exceptional cases and subject to various restrictions. In particular, they will need to obtain prior authorisation before accepting any appointments and will only be permitted to participate in one arbitration procedure at a time. They will also have to decline appointments by any State that is a party in a case pending before the Court, even if there is no substantial interference between that case and the case submitted to arbitration. This, H.E. Yusuf emphasised, “is essential to place beyond reproach the impartiality and independence of Judges in the exercise of their judicial functions”. H.E. Yusuf’s stern words are a far cry from the Court’s reassurances in its Annual Report 1995-1996, in which it states that the practice of its judges being appointed as arbitrators “involves a very limited number of judges for very limited periods” and “has no adverse effect on the pace of the work of the Court or the total precedence given to that work by its Members”. The ‘boom’ in investment treaty disputes, the number of which exploded over the last two decades, probably makes the first part of that statement inaccurate. It’s the second part of the statement, however, that H.E. Yusuf sought to address in his speech on 25 October, in which he solemnly concluded: “I cannot stress enough that any participation of Members of the Court in such inter-State arbitrations is subject to the strict condition that their judicial activities take absolute precedence”.